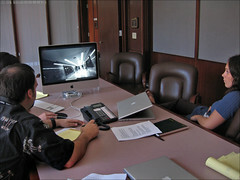 Just got back from a long week of judging the Best of Photojournalism contest. We were, again the guests of The Poynter Institute for Media Studies, and again, we hardly had opportunity to take advantage of the Florida spring. What we did see was more wonderful online journalism, over 900 unique urls this time around! In case any of you have been under a rock for the last two years, web video is big and about to 'blow up'. And lest anyone be confused - the best web video bears little resemblance to spot news photography - it is film making, plain and simple. Check out the top winners at BOP. I have been away from these pages for too long. I will explain all later. I am in Florida at the Poynter Institute judging the Best of Photojournalism contest. Apple is a sponsor this year and has been making a push into the photojournalism market in a big way - both by their presence and by listening to photographers. I can't help but think, however, as I watch the work roll by on screen, that we are all waiting for something better, the next thing that will define our visual space in the future. NPPA Best Of Photojournalism 2005 Web Site Category Winners. 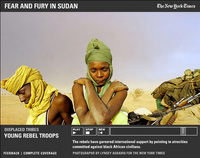 The New York Times on the Web was awarded the Best Use of the Web honor. “After a lengthy discussion with the judges attempting to find a single package that demonstrated the best use of the Web, the panel eventually recognized The New York Times on the Web as an example of a site that has truly helped the evolution of online storytelling,” judge Andrew DeVigal said. Here is the full list of this year's winners.